Laura Burgess, the founder and author of ecoscape says "ecoescape is defining a new way to travel proving that we can enjoy the environment but leave no hint that we'd ever been there. And we don't have to go far to do this. We believe that the best places to escape are closer to home than we had ever imagined." Laura traveled slowly throughout England, Scotland, and Wales, and has written about her cycling, bus, and rail routes to inspire others to take the same journey. "In the UK there are some of the most inspiring people and places that you will find anywhere in the world. It just takes some fresh eyes and a new mindset to enjoy them. For this inspirational and practical guide, we've found fifty of the best ecoescapes from around the UK. These handpicked experiences are sustainable from start to finish" says author Laura Burgess, "ecoescape is all about nurturing a new mindset about what travel is and how we travel through time and space in the world. We don't dictate a set of dos and don'ts. Instead we aim to create inlets to finding a greener holiday based on things we all like to do and experience already." The UK guide is the first in this new series about eco-travel. It will be followed by ecoescape: Ireland in May 2008, and ecoescape: Islands of Britain and ecoescape: Budgets and Backpacks will both be published in September 2008. 2009 will see four more ecoescape titles, including one to France. 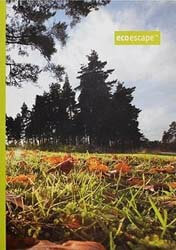 ecoescape: responsible escapism in the UK is available from Amazon.co.uk for £3.65, order yours now . Last updated by jack on 27 March, 2008 in Travel.